Are your Toyota Corolla’s headlights growing dim? Is one of them completely out? Are your taillights not working? No need to worry, they are pretty simple to change. 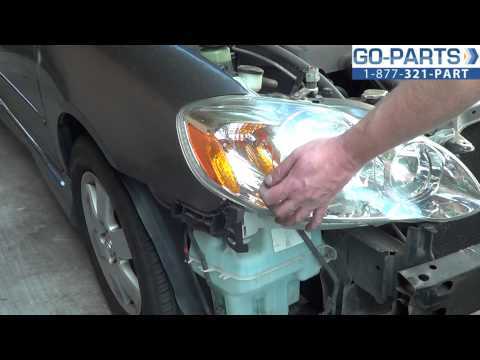 Here is how to replace your headlight and taillights. Have a headlight out on your Toyota Corolla? Get it fixed, here’s how. Before you begin working on your Toyota Corolla make sure you have a well lit location and an ample amount of time. Working in the dark or under a time crunch can lead to a botched repair. Also, remember to wear gloves since your skin’s oil can cause the new headlight to not last as long. Find any braces or coverings preventing you access to the rear of the assembly. Remove them. Look for wires feeding into the rear of the assembly. You should be able to feel a plastic housing for the bulb. Most headlight housing have a plastic tabs that you grasp and then turn. This will free the bulb. Carefully replace the bulb by matching up the slot where the old one came out from. Insert the headlight housing back and twist the bulb back tight. After you have replaced the bulb, it is a good idea to check to make sure it works AND look at your headlight alignment. Here is just one of many ways to check the alignment. Next, measure the distance from the ground to the headlight. Either draw or mark with masking tape a horizontal line across the board and/or garage door. Then, measure the distance between your headlights and mark that point. Turns on your headlights. Then, using the adjustment screws on the headlight assembly, adjust the lights until they shine on the masking tape and are an equal distance apart. The rule of thumb is that you want your headlights to shine below center and off to the right a bit. In order to replace your taillights, the first step is to make sure you know which one is out. Often this means, someone told you or you will need someone to stand behind you while you turn on the lights and/or tap the brakes. Then, it is an easy process of buying the right bulb and replacing it. Locate the taillight bulb housing. Trace the wires to right bulb. Remove the bulb and swap it out. Hopefully, this guide solved your head/tail light bulb issue. If you have any additional questions, let us know.